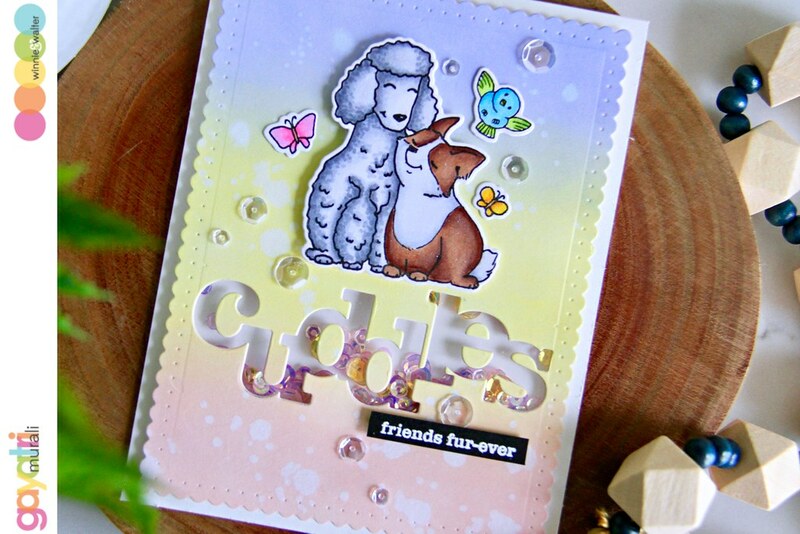 Cuddles – A Winnie & Walter card! Background panel is die cut using die from Essentials: Audrey Cutaway. Then sponged with the new distress oxide inks in the colours: Tattered Rose, Squeezed Lemonade and Shaded Lilac. Added clear water to get texture on the sponged panel. 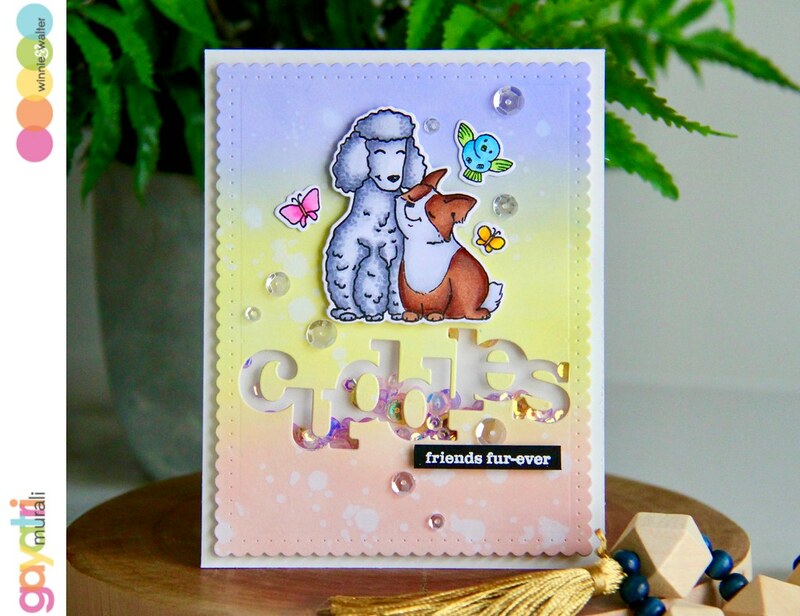 I stamped and coloured the images from Dog-Gone Cute stamp set using copic markers and die cut them using the coordinating cutaways. I die cut the sponged panel using In a Word: Cuddles cutaway and made a shaker element out of it. I saved the cuddle die cut for another card. The shaker element is filled with sequins from Pretty Pink Posh. I adhered the die cut images on top of the cuddles shaker element using foam adhesives. 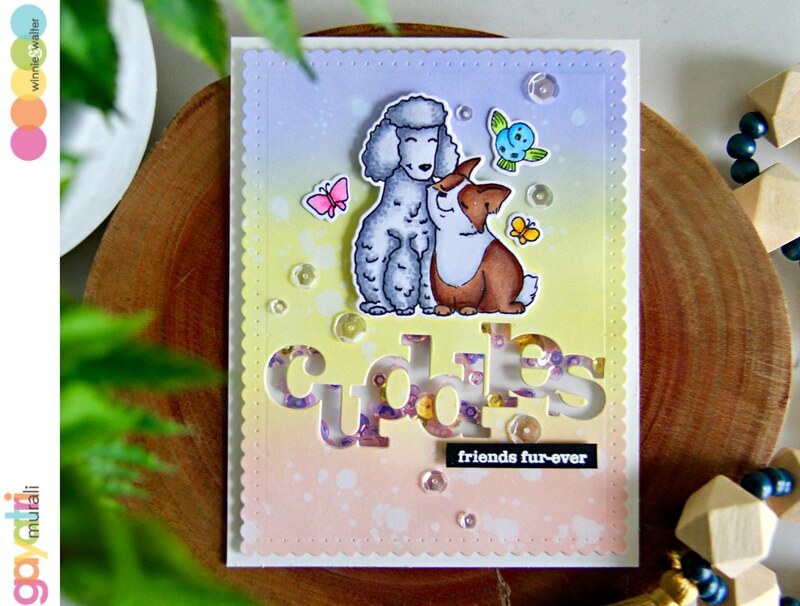 The secondary sentiment from the same stamp set is white heat embossed on black cardstock, trimmed and adhered below the cuddles shaker element using foam adhesive. I embellished the panel with some sparkly clear sequins. The completed panel is adhered on a cream card base. Hope you like this card. Drop by next time to see what I share next. Such a sweet card, Gayatri! And happy belated birthday wishes to you! Hope you had a wonderful day!